A slight change of pace from the usual tech-based posts around here, but it’s for a pretty worthy cause. Ciaran, Diego and I work in the tech side of Distilled Media, helping make sites like daft.ie, boards.ie and adverts.ie tick. 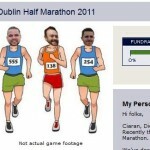 Recently the three of us had a collective fit of madness – we decided to get out from behind our computer screens, leave our sedentary lives behind and enroll to run the Dublin Half Marathon. Mark Pollock is a friend and colleague of ours who is also an adventure athlete, entrepreneur, motivational speaker and author. He has run marathons at the North Pole, the Himalayas and in the Gobi Desert, as well as competing in the Round Ireland Yacht race and winning medals for rowing at the Commonwealth Games. What’s most remarkable about all of this is that Mark has done this in total darkness, having lost his sight a little over 10 years ago. I can’t do his remarkable story justice, so please have a look at http://www.markpollock.com/ which does a far better job of explaining it than I could hope to. Recently Mark had a tragic accident which left him paralysed from the waist down. True to form, Mark is refusing to allow this dictate how he lives so is undergoing intensive sessions of physiotherapy and attending specialised rehabilitation centres with the aim of leading a full and independent life. The Mark Pollock Trust has been set up by his friends and family to help with the costs involved in his rehabilitation. Mark is genuinely one of the most inspirational and humble guys that you could hope to meet, so we want to help him out in whatever way we can. The MyCharity.ie site makes it very simple to donate with your credit or debit card, so we’d greatly appreciate any donation, big or small. Given the list of Mark’s achievements above, just running a half marathon does tend to pale somewhat in comparison. Though on the other hand there are three of us, each of us desk jockeys who spend far too long sitting on our backsides playing with computers, so you could look at it as us running a full marathon and a half in world record time (assuming you record our times based on when the first of us starts to when the last of us finishes, which is how I presume those records work). But I digress. I’m here to humbly request that if you have some spare change rattling around in your digital wallet, that you consider throwing it towards our donations page. MyCharity accept all credit/debit/laser cards, and it’s a pretty painless process to donate. Also, you get the warm fuzzy feeling of having done an exceptionally good deed, helping out your fellow man, without the blistered feet and later-life knee problems caused by actually training for and running the race, so it’s really a win-win for you! tl;dr: we want your money. Please send whatever you can to our donations page. Every little helps, as they say!